We can help you choose the type of heaters. See our exciting range of "Alfresco Wood Fired Ovens"
Convection roasting hood, side-burner, built-in or mobile, there's a Beefeater to suit you. There's lots of choice when it comes to selecting a heater for your home: gas or wood-fired, inbuilt or free-standing, different styles and designs - it can be quite confusing. With over 25 years' industry experience we know our heaters and can help you make the right decision for your heating needs. Endorsed by top Australian chefs, the Alfresco Wood-Fired Pizza Oven lets you escape the kitchen and entertain your guests. Cook everything from pizzas to roasts to breads and desserts, and it's easy to clean with no mess and no fuss. Attractive and efficient, you can take your cooking to a whole new level and the even heat provides for perfect cooking. 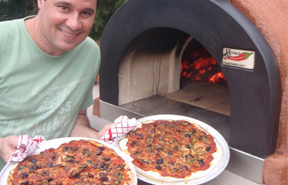 We installed an Alfresco Pizza Oven for Paul Mercurio a few years back. He's now published some great recipes at Alfresco's website. Yum! What a pleasant surprise it was when a tradesman turned up on time, not only for the quote,but also the installation. We were kept informed on the progress of our job from start to finish, thanks to the girls in the office. Thank you very much for a job well done.